Auto Money Generator found at automoneygenerator.com promises you a free money making machine that will change your life forever. Is it too good to be true? 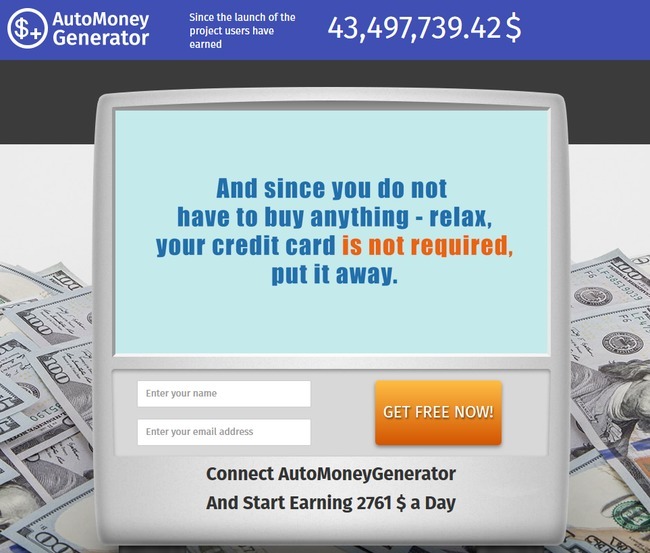 Is Auto Money Generator a scam? Let’s find out in our in-depth Auto Money Generator review. Paul Raven, the alleged owner of Auto Money Generator scam puts up some eye-popping profits right in the homepage. There’s a “real-time” counter that displays how much the users of Auto Money Generator have made since the launch of the project, and it keeps climbing up. Is it for real? Of course not. Note the number and try refreshing your browser by pressing F5. You’ll realize that the number resets to where it started as the page reloads. It is just a computer script that resets every time you load the webpage. The same goes for the promise of making $2761 a day. These are just common tricks used in internet scams to pique your interest and to make you watch the sales video. Once you focus on the video, it’s where Paul begins his brainwash session. Firstly, Paul Raven asks you to imagine a life where you can afford a beautiful house, a sports car, and luxurious vacations. He’s feeding your imaginations before he reveals his Auto Money Generator software. Once you get excited with the thought of getting ultra-rich, Paul congratulates you for being lucky because you have finally stumbled upon the real opportunity to make a lot of money online. And best of all, it comes free and fully automated! He uses reverse psychology by educating you about the online scams and assures you that he just wants to help you out. Indeed, there are hundreds of internet scams out there, but does it make Auto Money Generator a legitimate one? Unfortunately not. Auto Money Generator is a scam, and let’s look at the first proof we’ve discovered. 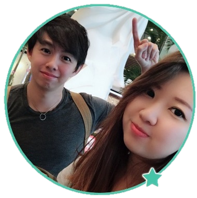 As you watch the sales video, Paul provides the testimonials of his members who claim that they have made a fortune with Auto Money Generator. 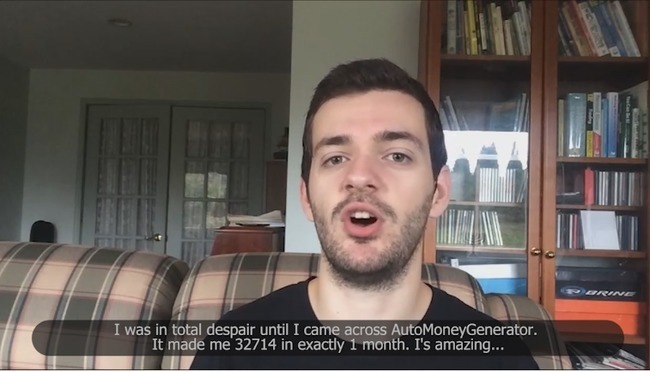 The member above claims to have made $32,714 in just 1 month after using Auto Money Generator. Now you may be thinking – since there are real people showing their faces and giving positive reviews, it must be real. 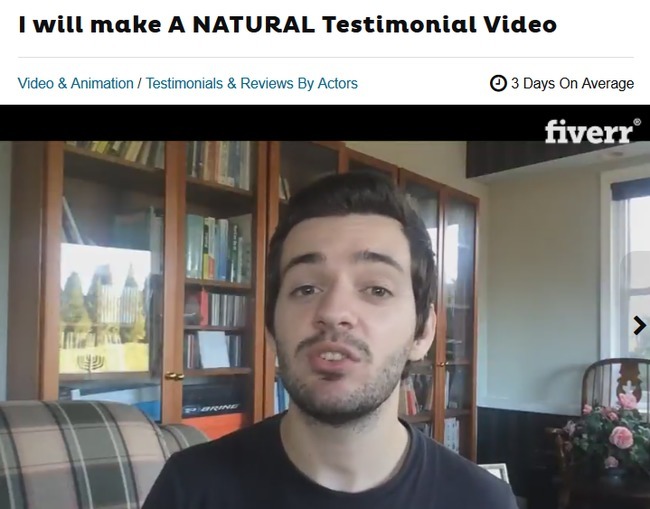 This particular “member” of Auto Money Generator is actually a Fiverr actor. You can check out his Fiverr profile here, and he made money by recording a fake testimonial for Auto Money Generator scam. It’s called buying a testimonial. Fiverr actors and actresses offer their services by reading the scripts of their clients like real testimonials. I’ve attached the description of the gig offered by this particular Fiverr actor. If Auto Money Generator is really as good as Paul Raven claims, why would he need to hire an actor and fake the testimonial? There’s only one reason – because he is out to get your money, but his software doesn’t work as advertised at all. So the next time you come across internet opportunities that sound too good to be true, such as Auto Money Generator, stay vigilant and do some research. They are most likely scams. We have a more conclusive evidence to prove that Auto Money Generator is a scam, but let’s leave it to the later part of this review. Since this is a binary trading software scam, I feel the need to explain how binary trading works to make sure everyone is on the same page. If you have traded binary options before, you may skip ahead to the next segment. This is how it works – let’s say I think that the Fx rate of EURUSD will fall after 60 seconds, and I bet $50 on a 1-minute contract. When the time is up, and the rate is indeed lower, I win a certain percentage of what I bet, usually between 60% to 80% (between $30 to $40). But if I’m wrong, I lose the entire $50 that I bet. To put it simply, trading binary options is not that different from gambling. There’s no way to predict the market movement in such a short period of time. Each trade you make is just like trying to guess the outcome of a coin toss – your chance of winning is not better than 50%. Even if you manage a 50% win rate, you’ll still lose money due to the uneven winning vs losing payout of binary options. This is why the vast majority of binary options traders lose money. How Does Auto Money Generator Work? Auto Money Generator is an automated binary trading software. It works just as the name suggests, it trade binary options for you automatically. Which means, you can activate the software and leave your computer alone, and it will place trades for you automatically without your supervision. In this case, Auto Money Generator is promising that it will only open a trade when it’s absolutely sure that the trade will end up winning a profit. Can their algorithm really predict the future? Unfortunately not. Anyone who has traded binary options and used automated trading softwares before (myself included) knows that there is no such thing as 100% winning algorithm when it comes to binary options. Need more proofs to show that Paul Raven and Auto Money Generator are lying to you? See below. Despite promising you a risk-free and guaranteed money making software, Paul Raven and Auto Money Generator are saying otherwise in their risk disclaimer. The risk disclaimer document is linked by a fine print at the bottom of the sales page, but how many people will click into it and have a thorough read? It’s very hard to read with its long sentences and small fonts. And it is deliberately made so to discourage you from reading. We do not purport this as a “get rich scheme”, nor should you view it as such. In fact, no guarantees are made that you will achieve any results from our ideas and techniques. Despite being a fully automated trading software, somehow your level of success with Auto Money Generator depends entirely on your ideas, techniques and effort. Compare this term to what Auto Money Generator scam claims in their sales materials, and you’ll see how they try to escape from their irresponsible promises. Even though Auto Money Generator promises you $2761 profit per day, you shouldn’t view it as a “get rich scheme”. That’s because “get rich schemes” that promise exorbitant returns are illegal in many jurisdictions. The earnings and results shown in the sales materials are intended to express the scammers’ own OPINION of Auto Money Generator’s earning POTENTIAL. In short, the trade results shown are not real! 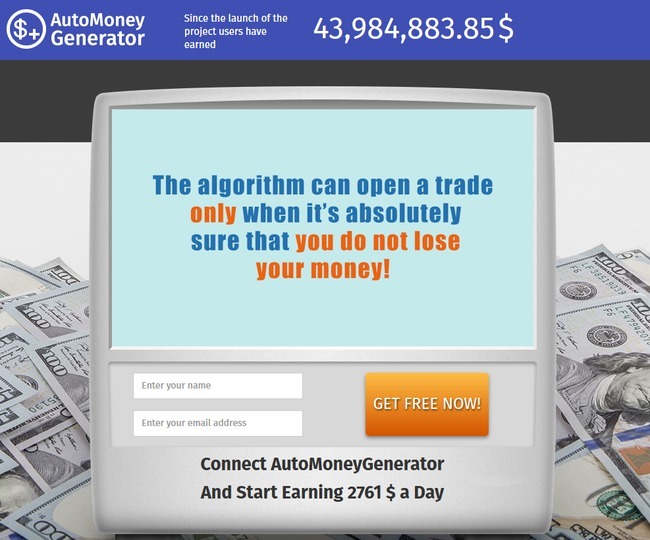 Despite boasting how Auto Money Generator only takes profitable trades, there’s no guarantee that you will achieve any results with the software. In fact, you are most likely going to lose all your deposits. Fact #3 alone should be enough to alert you and steer you away from Auto Money Generator scam. How can anyone trust an internet opportunity that reports fabricated earnings in their sales materials? Also, notice how the disclaimer mention CashCode at the end of their disclaimer. The scammers have just copied the disclaimer from some other scams and didn’t even bother to check for errors. These terms and conditions are not here to give you a fair warning as a consumer. The sole purpose of this document is to protect the scammers from legal actions when you lose all your money trading with Auto Money Generator software. If you decide to use Auto Money Generator, you need to register for a broker account through their sales page (which contains an affiliate link). Paul Raven and the team behind Auto Money Generator scam will earn a sum of referral fees as soon as you make your first deposit. I was assigned to TitanTrade, one of the affiliated brokers with Auto Money Generator. The minimum deposit with this broker is $250. Even if you already have a trading account with their designated broker, you have to register for a new one with a different email address. This is because the scammers behind Auto Money Generator scam cannot earn their referral fees if you don’t sign up through their affiliate link. Not only that, Auto Money Generator will continue to make money off you over a long period of time. They earn a commission for every trade that the software makes for you. The scary part is that the software runs completely on autopilot. The trading frequency and trade amount is fully determined by them. To put it simply, they can decide how much commissions to earn off you, as long as you still have money in your trading account. YES, AUTO MONEY GENERATOR IS A SCAM. As we’ve said in the review earlier, we don’t recommend binary options trading as a way to make money online, at all. It’s basically the same as gambling, and using an automated trading software is no different. You are essentially putting your hopes and entire investment in a piece of software that gambles on your behalf. If you hear anything says “auto” Money /free generator money/ please be careful they will take your money and rip you off. Check my blog for more scam over the net. AutoMoneyGenerator is just a big rip-off! The famous algorithm cost thousands of dollars, it calls only: buttocks or luck! Waste of money, it is useless! Yes it is. In fact binary trading softwares are all rip-offs, so don’t buy into any of them.